Christiana Care, Eastern Maine Medical Center, Sutter Health, Dignity Health, TriHealth, and CHI are expanding the use of Augmedix and Glass in primary care and numerous other clinic-based specialties. Google parent company Alphabet just unveiled an enterprise version of Google Glass. 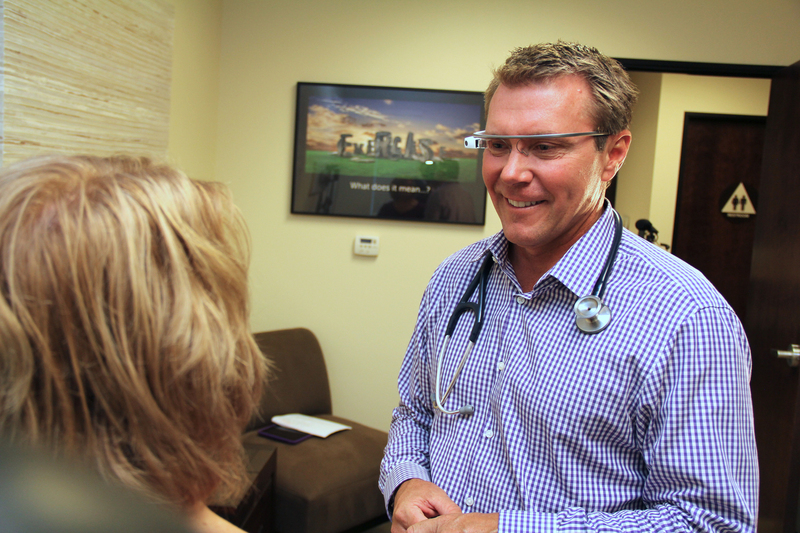 Augmedix and Google Glass enhancing physician-patient interaction. Augmedix sells its application to 12 hospitals, including Dignity Health, Sutter Health and TriHealth, to help doctors transcribe notes from patient interactions. How health systems are trying to use technology and additional services to help doctors reclaim their days. Augmedix, which is backed by big-name venture funds and a slew of actual healthcare providers have turned Google Glass into an effective time-saving platform for physician visits. Augmedix's use at clinics encouraged big health systems to invest. Digital health technologies will transform healthcare. Mobile phones have given health care providers the ability to engage with patients 24-7 and patients are able to capture and share data that may be helpful in tracking their health care. Interview of Molly Coye, Executive in Residence for AVIA and former Chief Innovation Officer at UCLA Health taken by Amy Compton-Phillips, Chief Clinical Officer with Providence St. Joseph Health. Augmedix, which has harnessed Google Glass technology to develop tools to improve physician workflow and productivity, has secured a $23 million round of funding from new investors McKesson Ventures, OrbiMed and others. It is a privilege to work to transform the trajectory of healthcare, and we are eager to continue providing human-centric solutions to the industry's biggest challenges. We saw some amazing new technology from Augmedix that uses Google Glass (a six-year old technology) to change the way you interact with your doctor during your next office visit. Augmedix outfits physicians with Glass eye wear from Alphabet's moonshot factory. The wearable technology is then used during patient exams, which streams audio/visual information from the clinic visit to an off-site team of tech-enabled scribes. In an effort to improve health care quality, outcomes and reduce health care costs, the Health Information Technology for Economic and Clinical Health (HITECH) Act  mandated the use of electronic health records (EHRs). California's Sutter Health is using Google Glass and Augmedix mHealth software to reduce time spent by its doctors on administrative tasks. Those improved workflows lead to less stress and burnout. By using Augmedix's remote scribes, a provider can save up to 15 hours per week. Wearing Google Glass Inspired Augmedix, A Live Transcription Service For Doctors. When Health care professionals walk into the clinic, they will simply log into their glass and connect to their Augmedix scribe. Augmented reality is roaring back to prominence as one of Silicon Valley's favorite frontier technologies, nearly three years after Google's brief, unsuccessful run at the market with its infamous smart glasses. Dignity Health’s Dr. Davin Lundquist, the California-based doctor has played a significant role in bringing the latest technology into hospitals across the country. In partnership with Augmedix, which utilizes Glass technology. Digital technology is changing how physicians work with patients, with augmented reality (AR) in place at some healthcare organizations such as the Sutter Health Network. The Google Glass team is Graduating -- and Augmedix is excited!